Come join us for an evening of fun, great flowers, plants and refreshments! Annuals, Perennials, Shrubs, Vegetables and More! Several door prizes awarded throughout the evening. 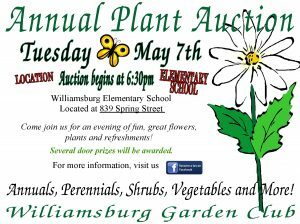 All proceeds benefit the beautification of Williamsburg. Please contact Sherri at sherriou99@fuse.net with any questions.